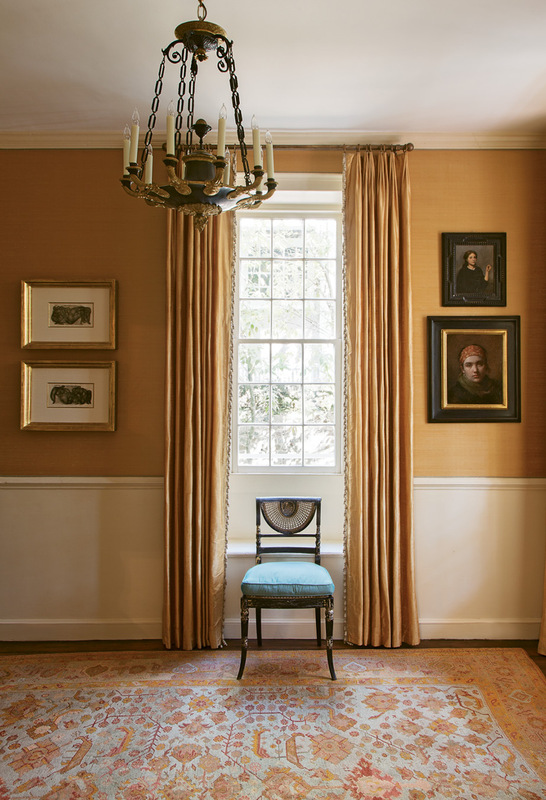 In the foyer, apricot-hued silk wall coverings and coordinating curtains provide an elegant backdrop for a pair of works by mid-century German Expressionist painter Otto Neumann and portraits by contemporary classical realists Daniela Astone and Charles Weed. 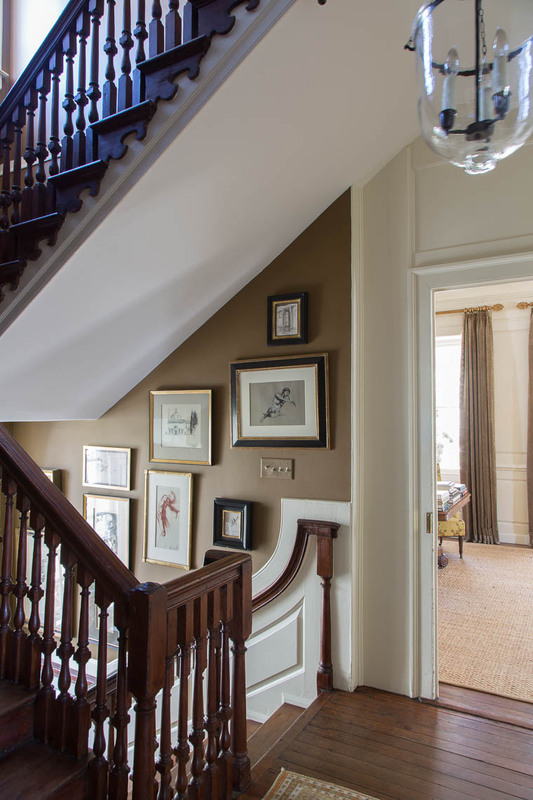 A 1968 portrait by French painter André Minaux sets the tone for the first-floor drawing room. “She has that little bit of pink,” says Ann. 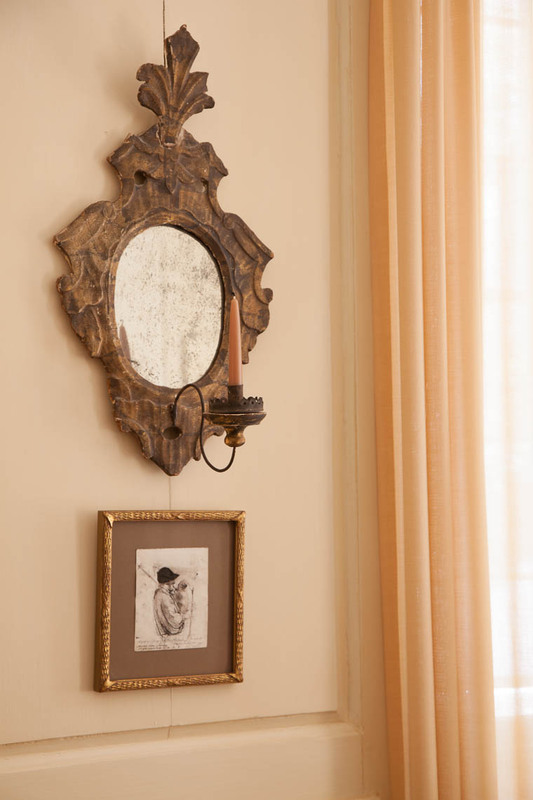 “We put her right over the classical Georgian fireplace and suddenly the room got very feminine.” Sketches by Ben Long and two still lifes by Jill Hooper round out the room’s luxe vibe. Ann has a deep love of nature that began with her father, who often took her birding in the ACE Basin. 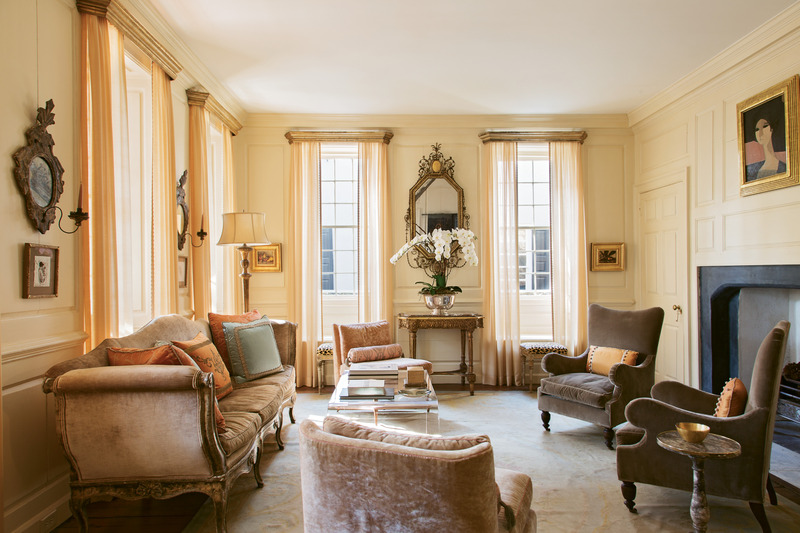 She’s still an avid birder, and her collection of turkey, pheasant, owl, and hawk feathers are displayed throughout the home. “I’m especially fond of my drawings, collected over the last 25 years,” Ann notes. 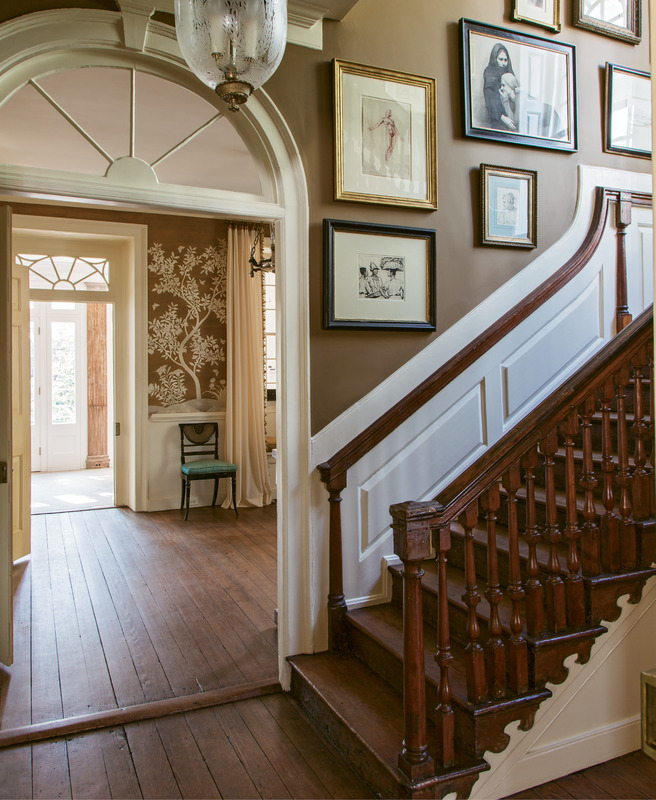 The stairwell walls double as a veritable gallery of these works, which span the 18th to the 21st century and include etchings by Alfred Hutty, a charcoal sketch by Italian artist Daniela Astonè, and figure drawings by Ben Long, among many more. 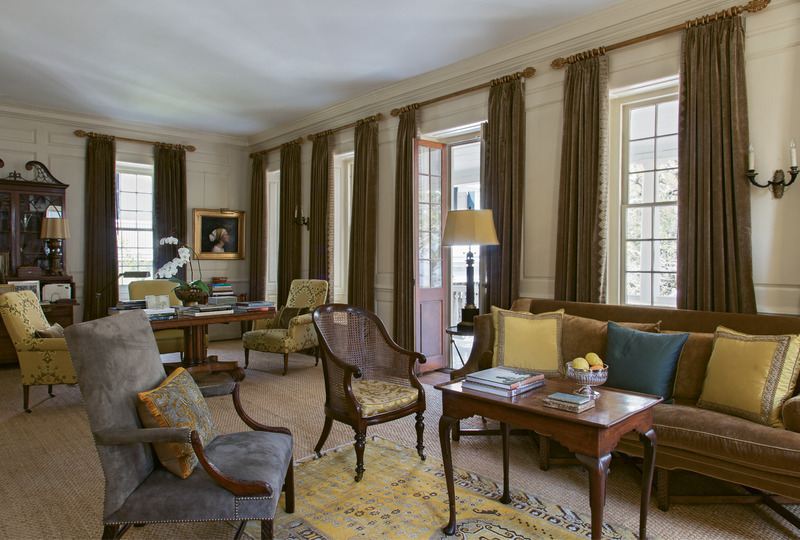 The upstairs drawing room is outfitted in a sophisticated palette of rich browns and yellows. 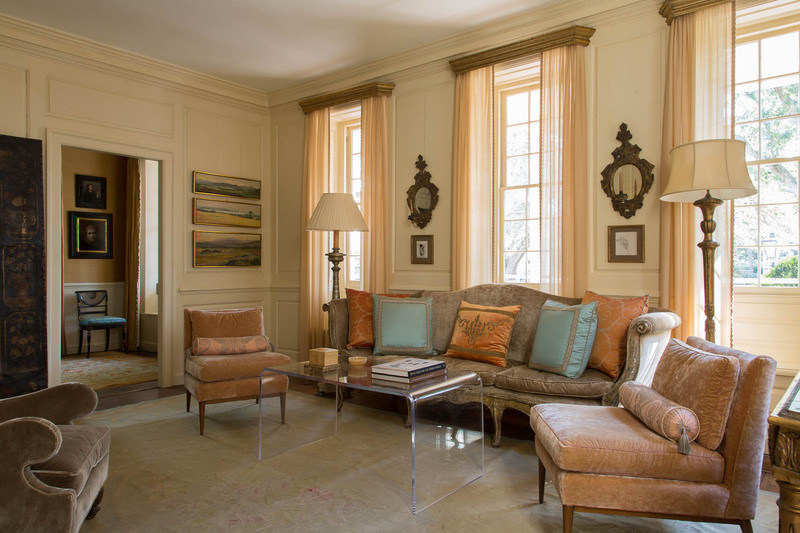 An inviting mix of textures, from an antique Khotan rug atop seagrass to suede upholstery on the 18th-century armchair, adds visual interest. A lifesize cartoon for fresco by Ben Long adorns the space. 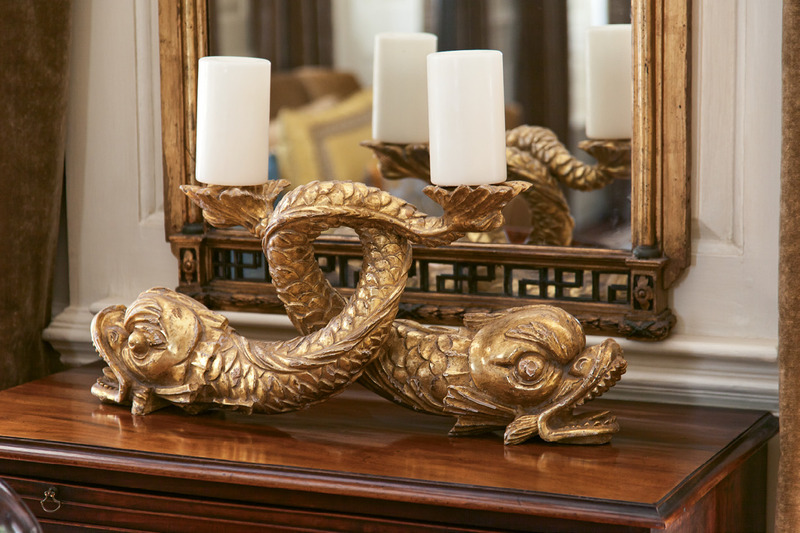 18th-century gilt dolphins found through G. Sergeant Antiques play nicely off the gold tones seen throughout. 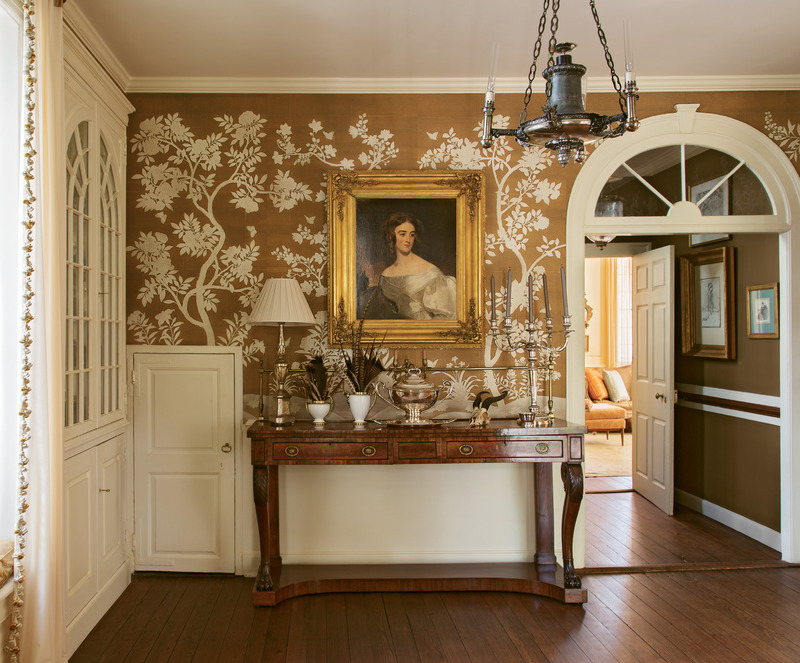 In the butler’s pantry, hand-painted Gracie wallpaper complements a portrait of Mary Roane Ritchie Green by 19th-century master portrait artist Thomas Sully, who completed more than 2,000 works of wealthy patrons and politicians. 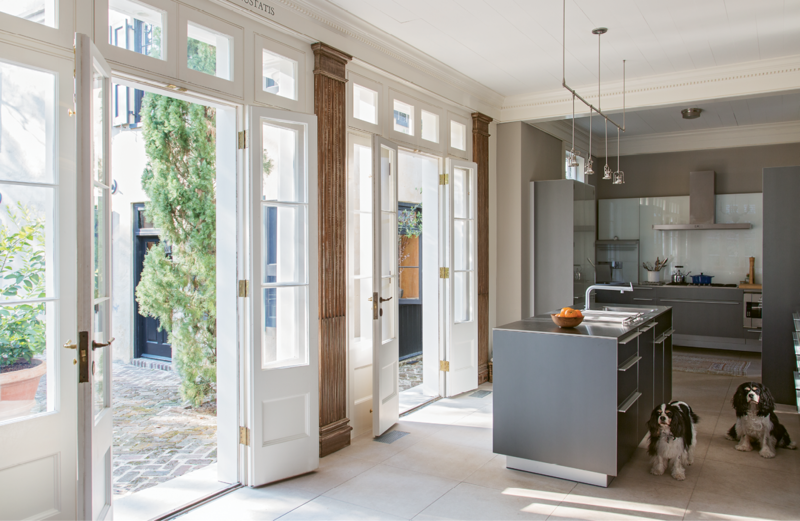 Sleek cabinetry by Bulthaup commingles with antiqued pilasters in the kitchen, located within what was once the rear porch. 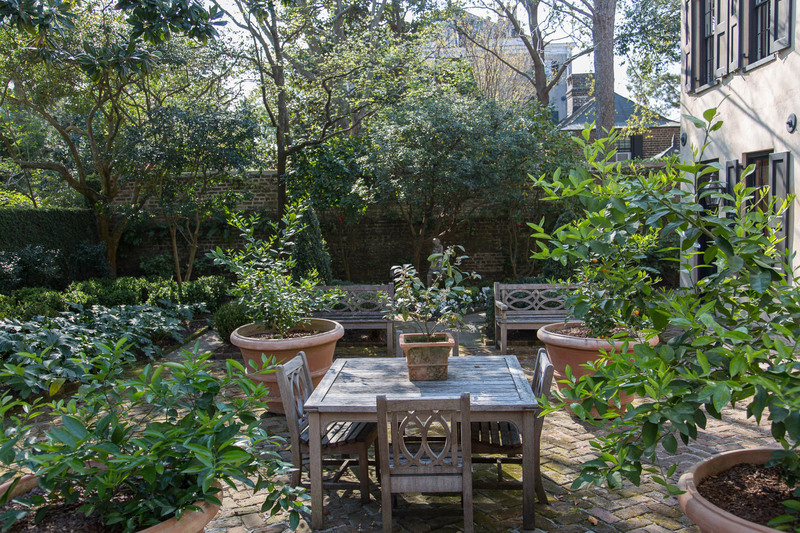 The courtyard was originally laid out by celebrated landscape architect Loutrel Briggs. 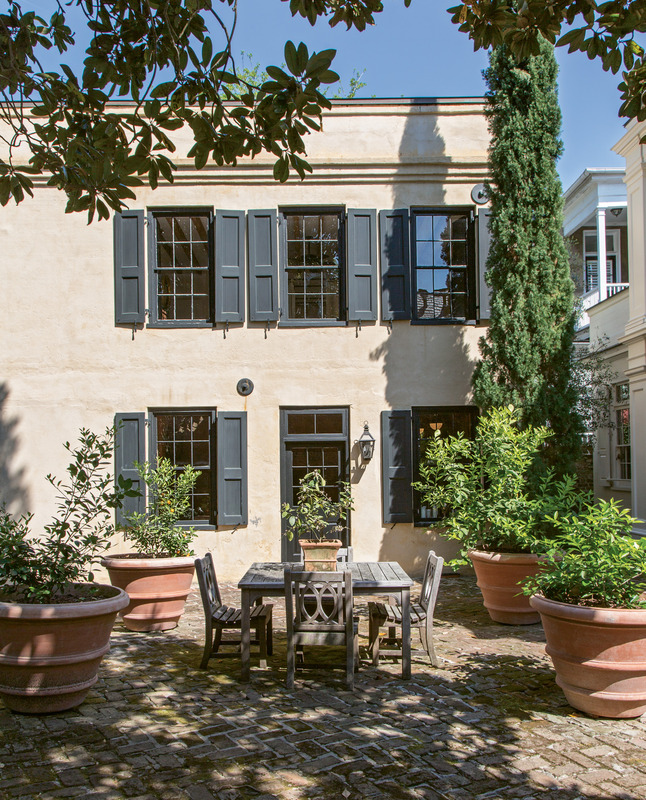 The guest house, built circa 1850, stands perpendicular to the main residence and includes its own kitchen and living space. 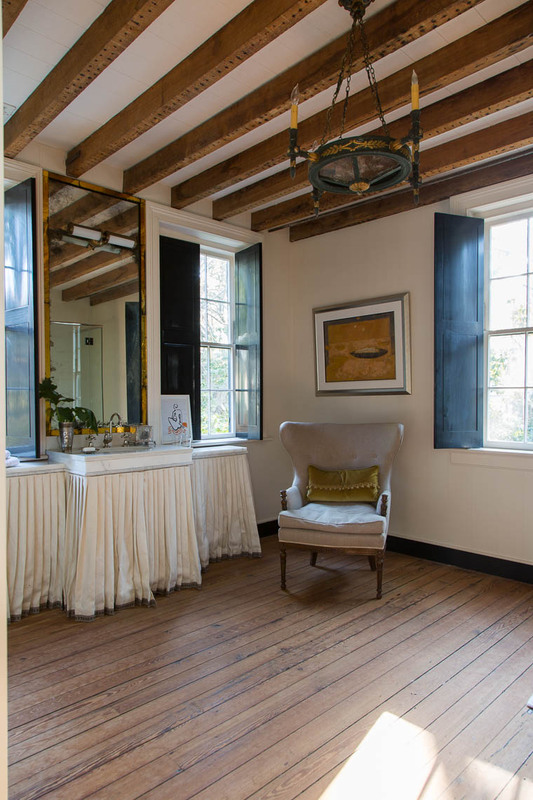 The separate guest quarters, located within what was once a detached kitchen house, feature original exposed wood beams and wood flooring. 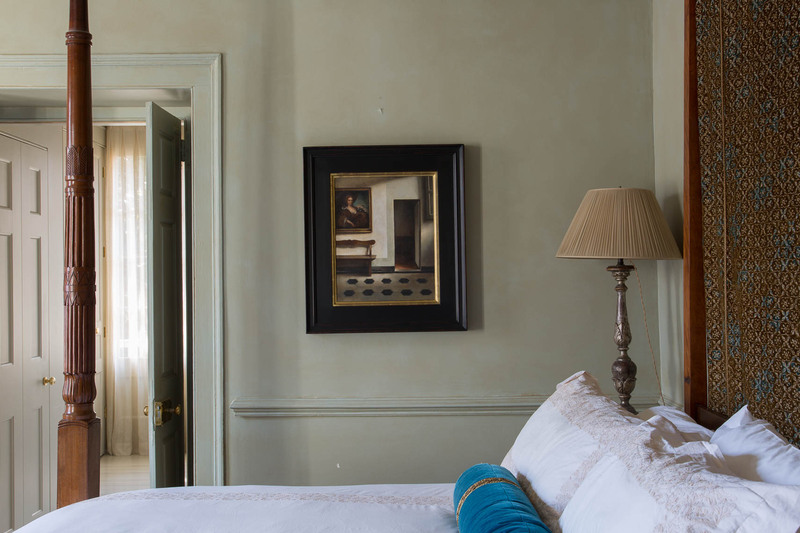 The guest quarters feature more breathtaking artworks, such as Otto Neumann monotypes. 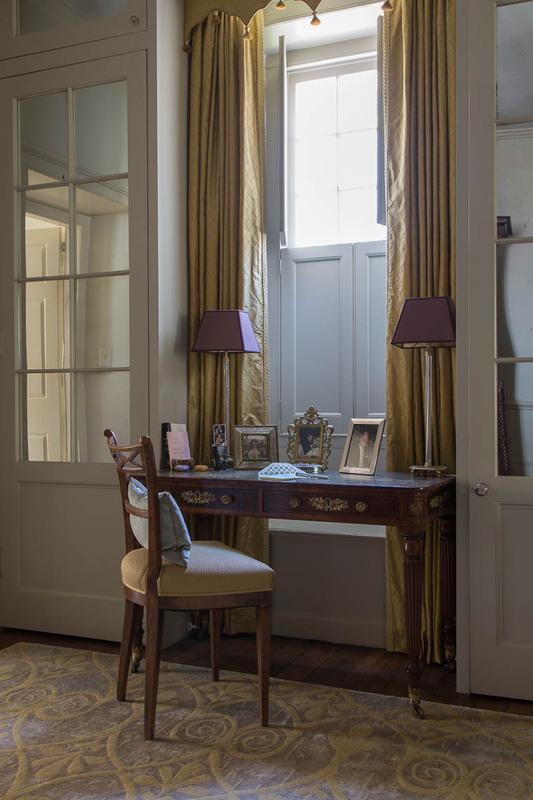 If it weren’t for the luxuriously appointed interiors—and the two adorable Cavalier King Charles spaniels frolicking underfoot—walking the rooms of the 18th-century South-of-Broad manse Ann Long Merck shares with her husband, Tony, would feel a bit like wandering the corridors of an art museum. 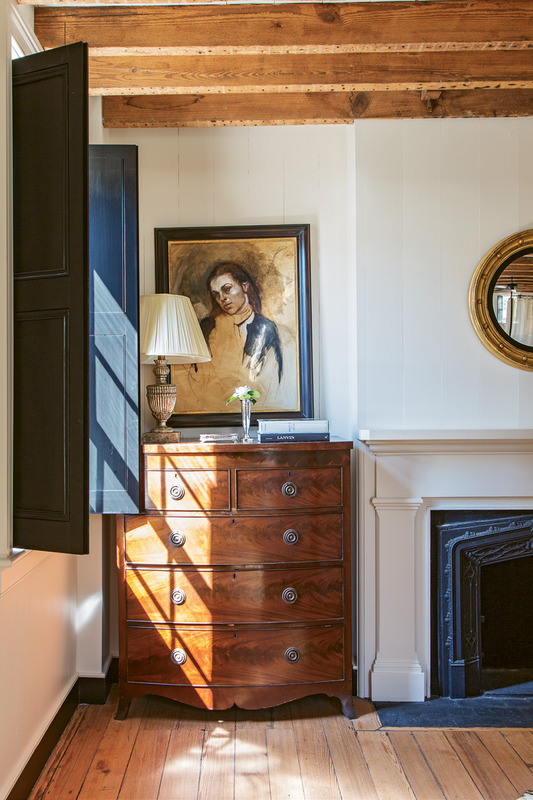 There are beautiful canvases at every turn; even the butler’s pantry boasts a piece by Thomas Sully, a 19th-century master portrait artist whose work also hangs in New York’s Metropolitan Museum of Art and London’s National Portrait Gallery. 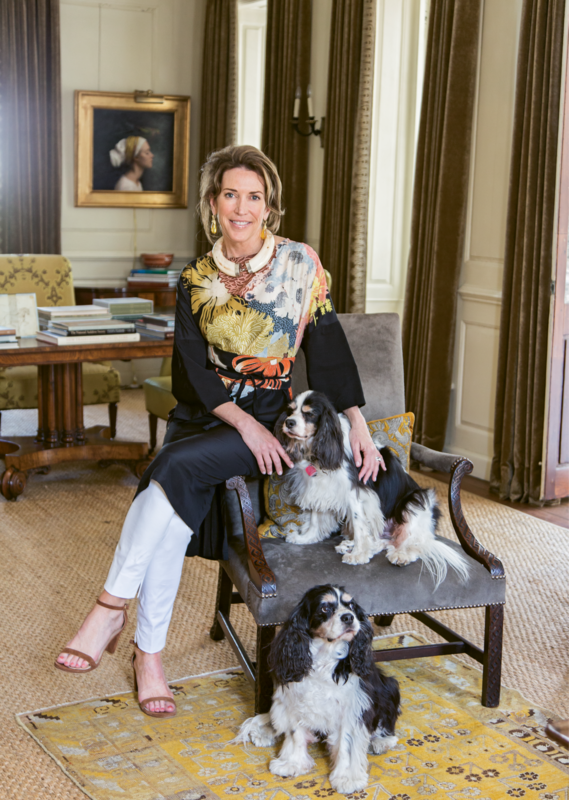 Their stunning personal collection is no surprise given that Ann is the force behind Ann Long Fine Art, the Broad Street gallery that this year celebrates its 20th anniversary. But Ann’s role as an art doyenne is a bit of a surprise to the lady herself. 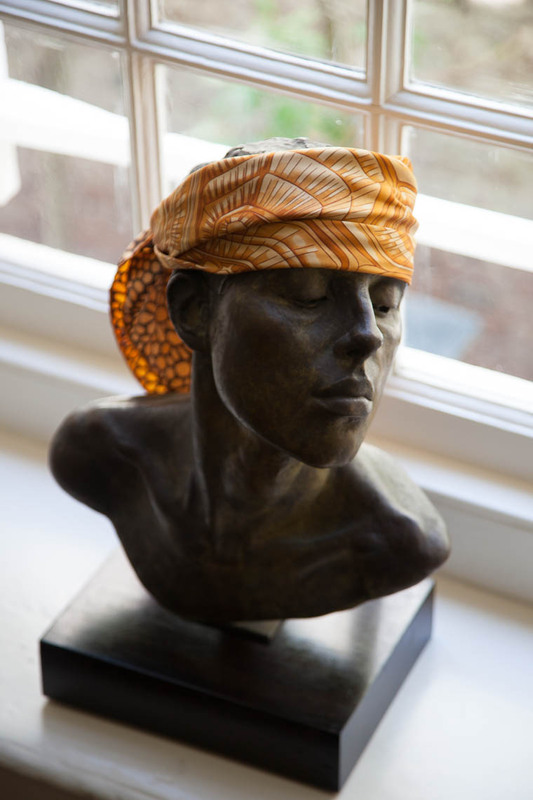 Two decades ago, when she popped by an exhibit of painter Jill Hooper’s work at a second-story loft on Broad Street, just a block east from where her own gallery now stands, she had no idea her life was about to change profoundly. But while taking in Hooper’s exquisite still lifes, Ann was astounded and inspired. “My first thought was: nobody paints like this today. Who is this girl?” Ann recalls. She was particularly moved by one piece depicting a simple tableau of fish laid out on a wooden table. 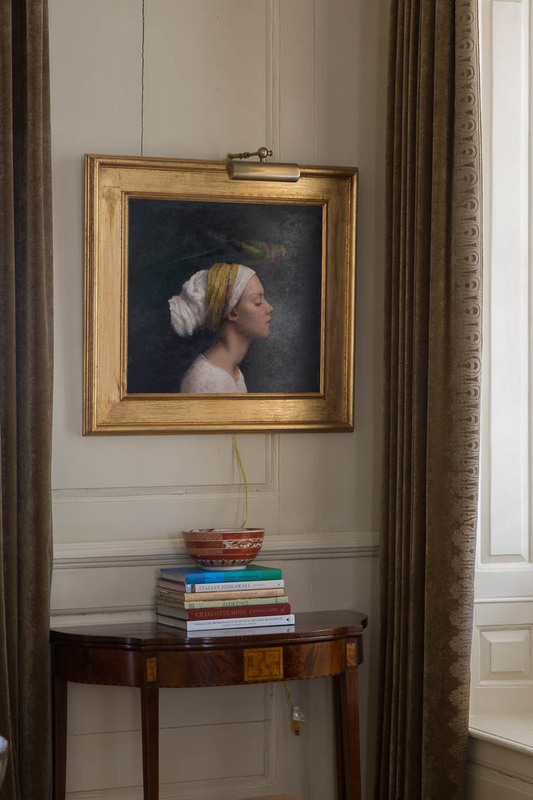 “It was like something by [Jean-Baptiste-Siméon] Chardin; it was one of the most stunning paintings I’d ever seen by a living artist,” she recalls. 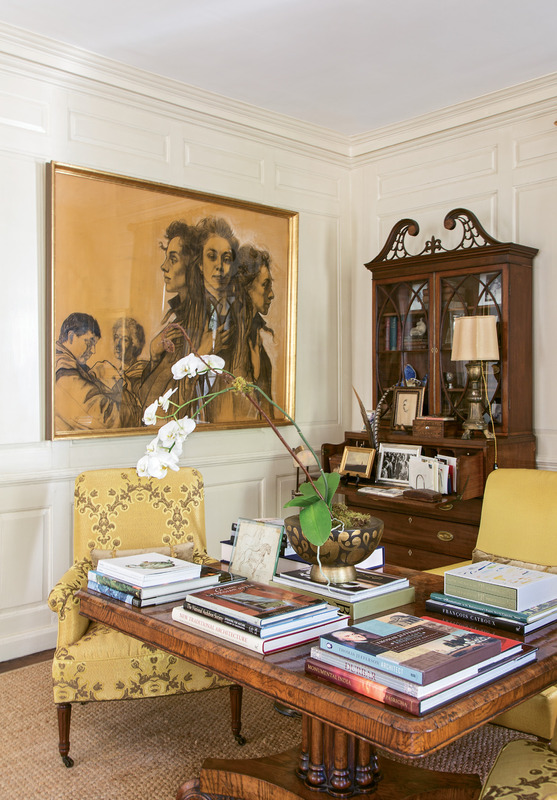 Ann bought the painting, and in the process, kicked off a lasting friendship that began with Ann sitting for Hooper, who paints from life, and led to Ann hosting invitation-only shows of Hooper’s work in her own home. The exhibits were so successful that soon other classically trained painters, such as Frank Strazzulla, Jr. and Kamille Corry, were asking Ann to represent them. 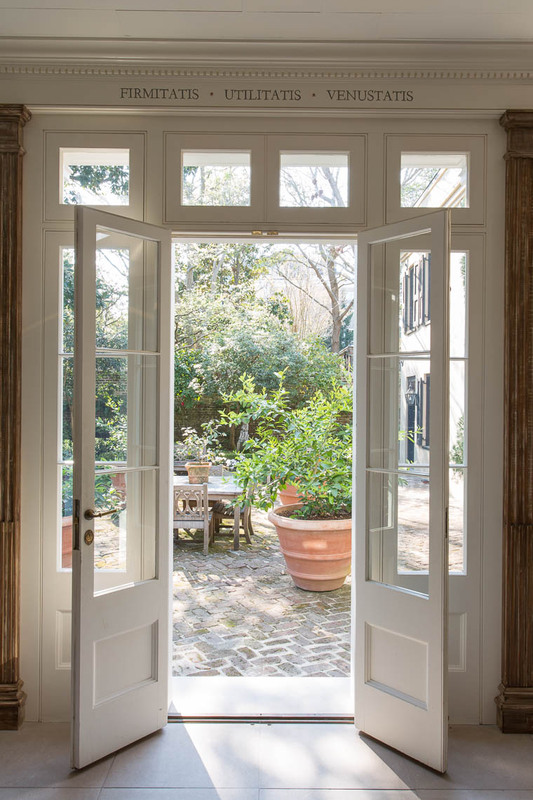 By 2001, she had transitioned the operation from her home to an official gallery space, and since then, she has built an impressive stable of artists, ranging from contemporary classical realists like Hooper to 20th-century modernists, including the late William Halsey. 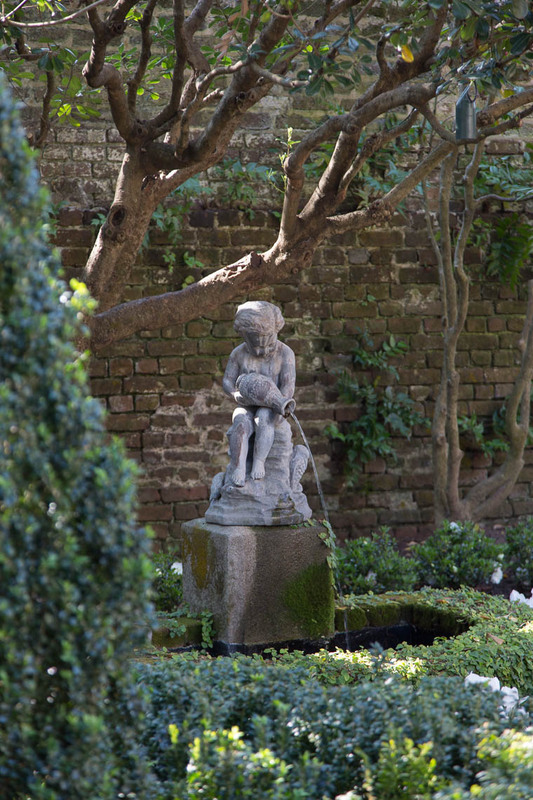 Running parallel to Ann’s love of fine art is a deep appreciation for architecture that extends back to her childhood in Walterboro, South Carolina, and her mother. “She should have been an architect,” says Ann. 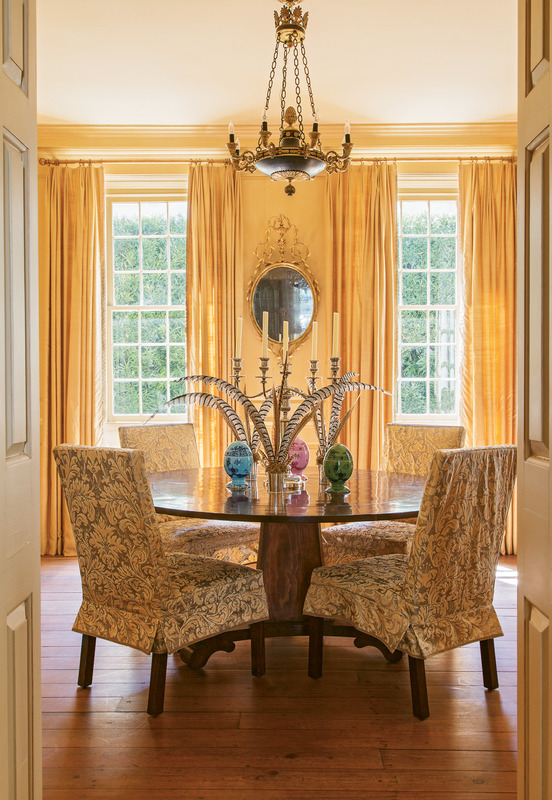 “She had a real love of Palladio and the classical order.” She and Tony have lived in a number of old homes, and the two share a passion for preservation. 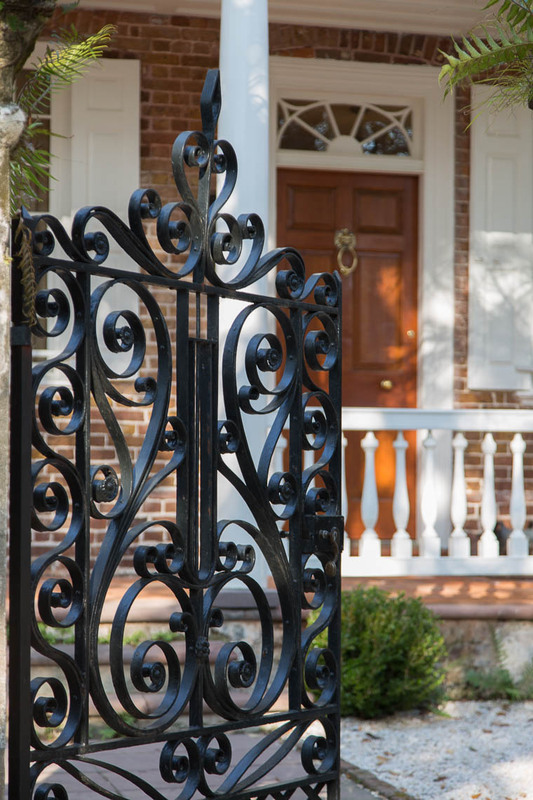 “We weren’t actively looking but mentioned to a realtor friend that we wanted a small, architecturally significant home if one ever became available,” Ann says. 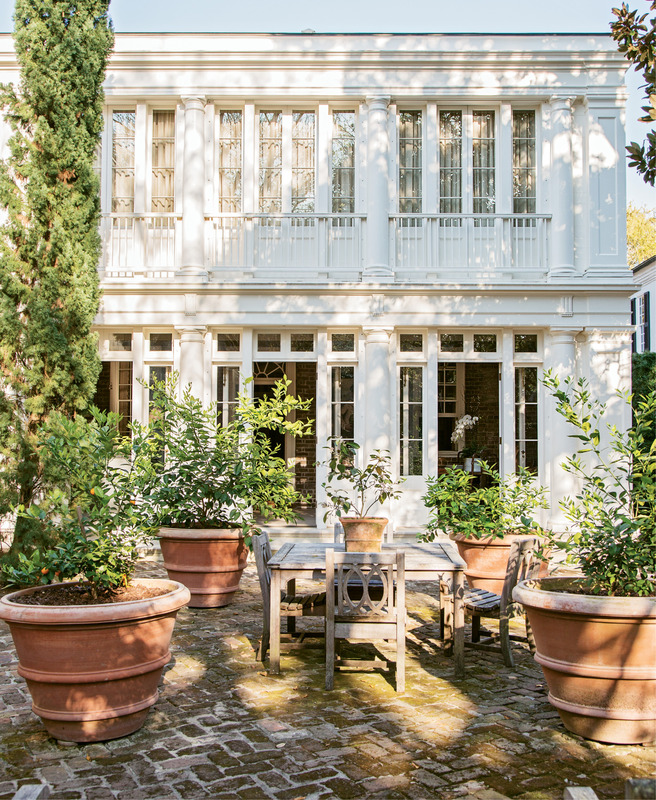 And so in 2009, when a pre-Revolutionary, three-story brick manse with fine Georgian detailing hit the market for the first time in more than a century, the art dealer and her husband seized the opportunity to buy the place and make their home within the walls of an architectural masterpiece. 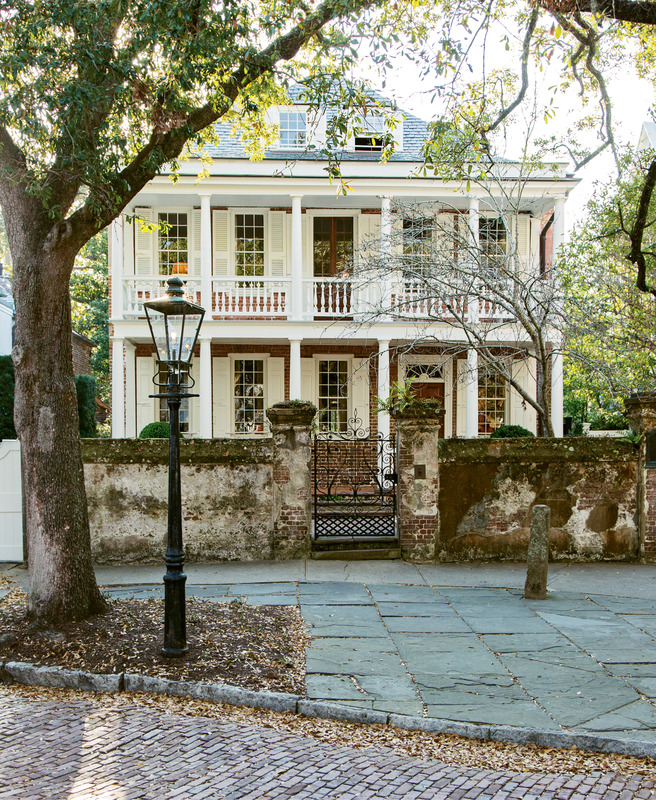 Dubbed the George Everleigh House for its first resident, a prosperous trader who made his fortune in deerskins, the circa-1743 domicile and its carriage house offered a treasure trove of special details, including cypress wall paneling throughout the public spaces and original Dutch terra-cotta pavers on the first-floor piazza. 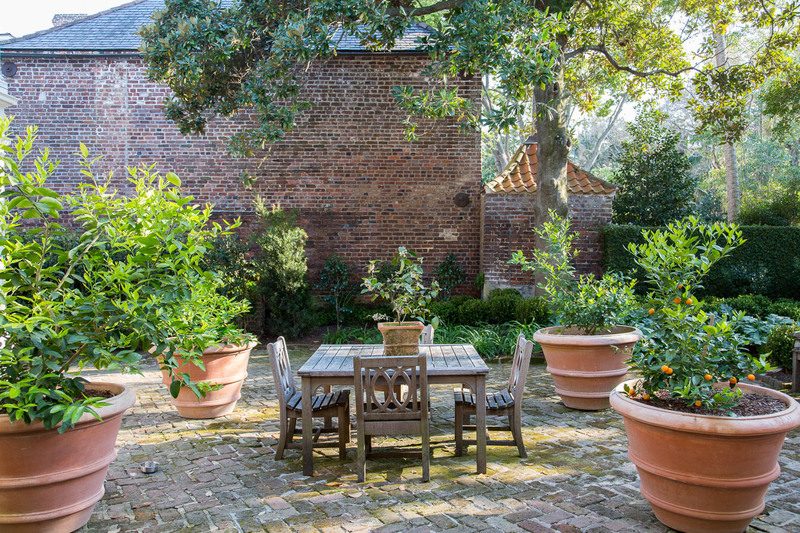 The structure’s interiors, facade, and Loutrel Briggs-designed garden are all protected by Historic Charleston Foundation easements, which means renovations are subject to the group’s approval. Rather than being frustrated by the restrictions, the Mercks found them reassuring. 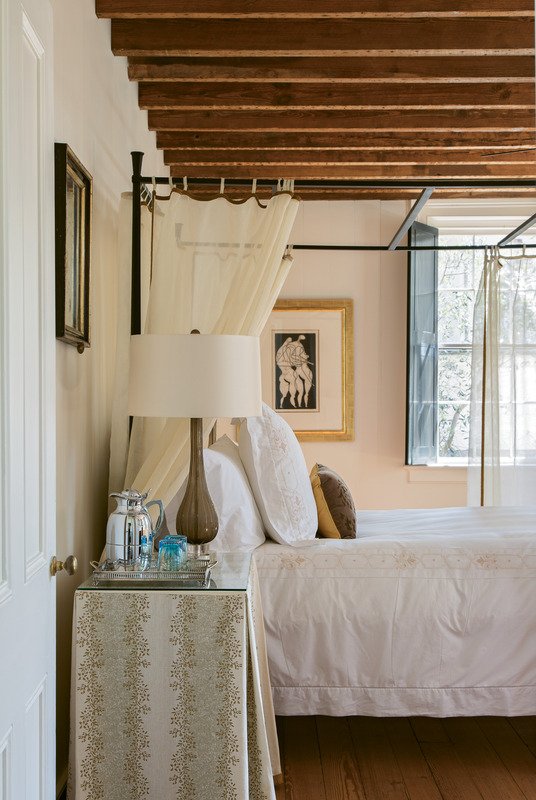 “This is just the kind of house we wanted: one that had been protected, and we wanted to do the same,” she says. 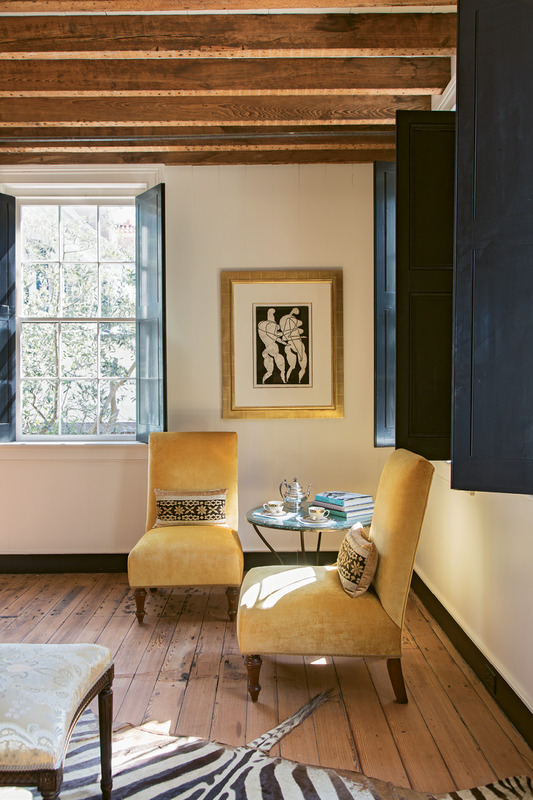 With Historic Charleston Foundation’s approval, the Mercks reimagined the kitchen, positioned within what was once a rear piazza, with strikingly contemporary Bulthaup cabinetry and appliances. 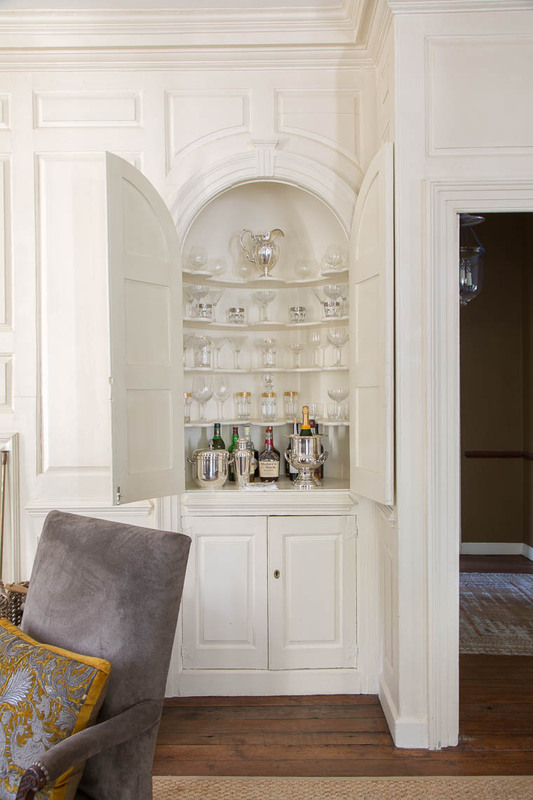 “Tony loves to cook, and instead of doing a kitchen that looks sympathetic to the period, he suggested making it as modern as can be,” Ann says. 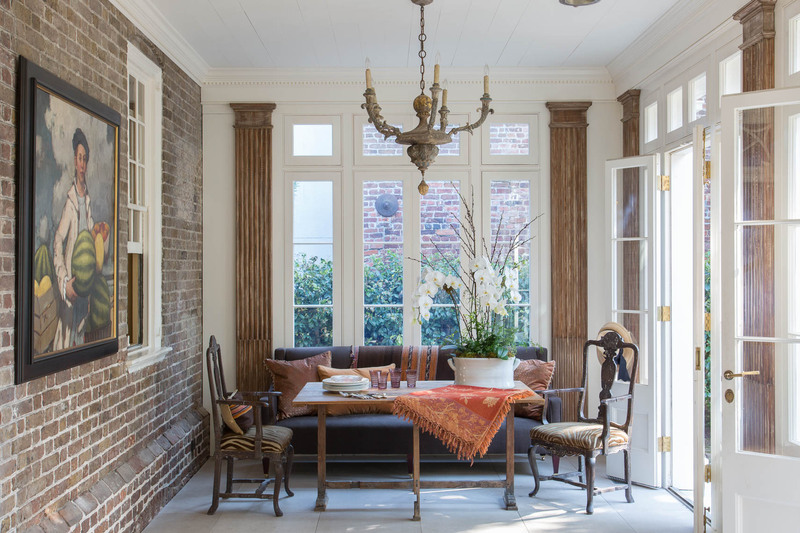 “Everything that encloses it is classical, but the kitchen itself is Jane Jetson-modern; we wanted that juxtaposition to be significant.” Historically appropriate details, such as patinaed wood pilasters and a brick wall that was once part of the home’s exterior, ensure that the sleek scullery feels in step with the rest of the space.